WEST COVINA — Authorities Wednesday continued seeking a motorcyclist who, along with more than 100 fellow bikers, shut down the 10 Freeway in West Covina over the weekend to propose to his now-fiancee. The cyclists brought all traffic lanes to a halt and blocked an offramp for the proposal, as some bikers popped wheelies and turned donuts to celebrate. Online comments posted on viral YouTube videos of Sunday’s 1:30 p.m. stunt on the eastbound San Bernardino (10) Freeway at Barranca Avenue range from support to fury. In addition to numerous traffic violations observed in the YouTube videos, officers are also investigating the incident as conspiracy to commit a crime, which can be prosecuted as a felony. The motorcyclist had been identified and indicated he would turn himself in to investigators, Stormes said, however that had not taken place Wednesday morning. The CHP and Los Angeles County District Attorney’s Office planned to prosecute the case to the “fullest extent” of the law, Stormes added. Another group of men who intentionally stopped the Hollywood (101) Freeway in Los Angeles during rush hour in October of 2010 to promote their rock band were charged and convicted of felony charges last year. The band members stopped a large truck plastered with an advertisement for their band on the southbound 101 Freeway at Sunset Boulevard, blocking all but one lane of the freeway, before climbing on top of the truck and playing their instruments, according to district attorney’s officials. The obstruction lasted about four hours. The three members of an Orange County rock band each pleaded no contest to a felony count of conspiracy, as well as a misdemeanor county of creating a public nuisance and two misdemeanor counts of resisting, obstructing or delaying police. Christopher Roy Wright, 34, David Paul Hale, 32, and Keith R. Yackey, 33, were sentenced to three years probation and 35 days of community service. PICO RIVERA — Deputies jailed an auto theft suspect Sunday following a pursuit after a man reported spotting his truck, which had been stolen, parked in a Pico Rivera neighborhood, authorities said. Suspected Lynwood gang member Daniel Gomez, 44, was booked on suspicion of auto theft, reckless driving and felony evading of police following the incident, Los Angeles County sheriff’s Lt. Joe Mendoza said. A man called sheriff’s officials shortly before 2 p.m. to report seeing his red Ford F-150 pickup truck, which had recently been stolen, parked in the 6600 block of Baquette Avenue, Mendoza said. On arrival, deputies saw a man — later identified as Gomez — and a woman standing beside the truck, the lieutenant said. As deputies approached, the man jumped into the truck and drove off, initiating a chase, Mendoza said. The woman did not get into the car. She could not be found later. Deputies chased the truck south on Rosemead Boulevard until it crashed into a curb near Rex Road and the driver got out and ran into a nearby neighborhood. As officials were working to set up a search perimeter, Gomez made his way back to the truck and again led deputies on a brief vehicle chase, Mendoza said. Gomez crashed the truck into the gate of an apartment complex in the 9000 block of Burma Road before exiting the vehicle and forcing his way into an apartment. The apartment was later determined to be the residence of an acquaintance of Gomez’s. Deputies followed Gomez into the apartment, found him hiding in a closet and arrested him without further incident, Mendoza said. Information regarding Gomez’s bail and initial court appearance was not available Sunday afternoon. 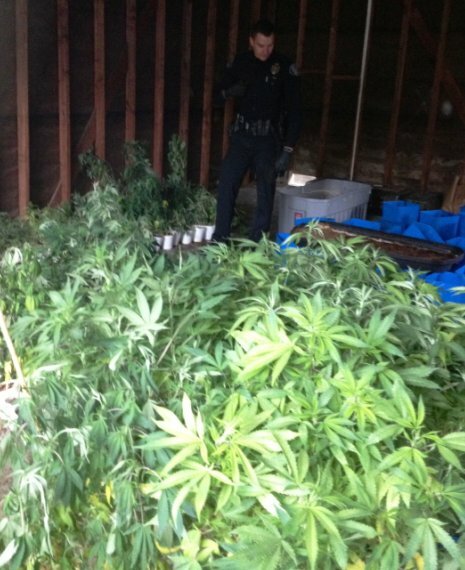 ARCADIA — A complaint about loud music early Sunday led police to discover a “sophisticated” marijuana growing operation in an abandoned Arcadia home, authorities said. Chuan Wu Pang, 30, of Alhambra was arrested in connection with the bust, which took place shortly after 2:30 a.m. in the 2500 block of South Santa Anita Avenue, Arcadia police Sgt. Tom Le Veque said in a written statement. It appeared the home’s electrical meter had been bypassed as well, allowing Pang to steal electricity from Southern California Edison’s grid, officials said. “Every room, closet, hallway and usable space inside this approximately 2,500-square-foot, four-bedroom home was being used to facilitate the operation,” Le Veque said. Police were first summoned to the home after someone called to report loud music, Le Veque said. Officers encountered Pang in front of the home, and he told officers he would lower the music. When questioned, Pang told officers the house belonged to a friend, who gave him permission to be there, but he couldn’t recall the friend’s name, according to police. The man then showed officers a key, which he demonstrated could be used to open the door. “When the door was opened, officers saw items consistent with an indoor marijuana grow and smelled the overpowering odor of marijuana,” Le Veque added. The home was secured, and detectives returned with a search warrant. There was no evidence the marijuana was being grown in compliance with California medical marijuana laws, police added. According to county booking records, Pang was being held in lieu of $30,000 bail at the Arcadia Police Department’s jail pending a scheduled arraignment Wednesday in Pasadena Superior Court. ARCADIA — Police arrested a man on suspicion of attempted murder and other crimes early Sunday after he tried to drive himself and a woman over a cliff, then barricaded himself inside the home of the Santa Anita Dam keeper for seven hours, authorities said. “Further investigation revealed the driver of the vehicle intentionally hit the guardrail in an attempt to kill both himself and his passenger — changing the focus of the investigation from a traffic accident to attempted murder,” Arcadia police officials said in a written statement. The woman, whose age was not available, was unhurt, police said. Officers searched the area but did not find the driver. Gonzalez and the woman were believed to be in a relationship or formerly involved in a relationship, Castro said. But several hours later, just before 1:20 a.m., police received a 9-1-1 call from the home of the dam keeper at the Santa Anita Dam reporting an intruder inside the house, officials said. The dam keeper and his wife got out of the home safely, but the intruder remained inside, Castro said. It was determined the man who broke into the house was the same man involved in the earlier crash. Police made repeated attempts to order the suspect — later identified as Gonzalez — to surrender, but he remained holed-up in the house, police said. The residents also advised police that there was a loaded gun inside the house. Los Angeles County Sheriff’s Department SWAT team members were summoned to the scene and took over the stand-off. After a little more than seven hours, they entered the home and took Gonzalez into custody, according to Arcadia police. He was hospitalized in unknown condition for injuries he was believed to have suffered in the crash and while fleeing from it, Castro said. He was not believed to have been injured during his arrest. MONROVIA — A fire sparked be an electric blanket left an elderly couple homeless Sunday morning, authorities said. The fire was reported about 9:30 a.m. at a single-story house in the 300 block of South Mayflower Avenue, Monrovia police Sgt. Don Newton said. The residents continued trying to extinguish the flames themselves by spraying a garden hose through an external window, also without success, the chief said. A neighbor called 9-1-1, he said. The home was “fully involved” with flames when firefighters arrived. Firefighters extinguished the fire and kept it from spreading to other structures, but it was a total loss, Donovan said. They encountered “hoarding conditions” inside the home, which provided ample fuel for the flames. Officials estimated the fire cause about $250,000 worth of damage to the home and its contents. Officials were working with the Red Cross and local charities to secure temporary lodging for the displaced couple. GLENDORA — Police arrested three men at a Pomona scrap yard Saturday after they were found with a trailer and other items stolen from a Glendora business earlier in the day, authorities said. Luis Salazar, 30, and Daniel Saldana, 26, were booked on suspicion of auto theft, burglary and possession of stolen property following Saturday morning’s break-in at a business in an industrial neighborhood in the 1100 block of South Nicole Court, according to Glendora police and Los Angeles County booking records. Alexander Torres, 22, was also arrested on suspicion of possession of stolen property, though he was not accused of taking part in the initial burglary, Glendora police Lt. Rob Lamborghini said. The investigation began about 8 a.m. when police received a report of a break-in at the Nicole Court business, the lieutenant said. “The suspects stole a trailer registered to the company, they loaded it up with pallets, propane tanks, scrap metal and other items before they hitched a truck to it and drove away,” he said. At the suggestion of the investigating officer, a business employee began checking area scrap yards to see if he could find any of the stolen scrap, Lamborghini said. “He located the stolen trailer and the suspects at a scrap yard in Pomona,” the lieutenant said. Glendora police responded and arrested the three men. Some of the scrap metal was recovered, while other items remained missing, Lamborghini said. According to county booking records, Salazar was being held in lieu of $45,000 bail, while Saldana was being held in lieu of $20,000 bail. Both were scheduled for arraignment Tuesday in West Covina Superior Court. GLENDORA — Police arrested an 18-year-old Covina man and a 12-year-old Glendora boy Saturday on suspicion of scrawling graffiti on dozens of spots at a Glendora school, officials said. Justin Cardoza and the juvenile suspect were accused of felony vandalism following the overnight graffiti spree at the Sunflower Alternative School, 1505 S. Sunflower Avenue, Glendora police Lt. Rob Lamborghini said. Police estimated the damage to the school, which was vandalized throughout, at more than $2,000. The vandalism was first reported just before 10 a.m., and within minutes, police had identified the suspects and located them at Wingate Park in Covina, Lamborghini said. The 12-year-old suspect was released to his parents with a written promise to appear in court, police said. Cardoza was being held in lieu of $20,000 bail at the Glendora Police Department’s jail pending a scheduled arraignment Tuesday in West Covina Superior Court. COVINA — A convenience store clerk used a “wet floor” sign to fend of a would-be beer robber armed with a pool cue early Saturday, officials said. Martin Rivera, 21, of San Dimas was arrested on suspicion of attempted robbery following the 3 a.m. incident at 7-Eleven at Citrus Avenue and Covina Boulevard, Covina police Sgt. Gregg Peterson said. He entered the store brandishing a pool cue above his head and tried to steal a 12-pack of Modelo beer, the sergeant said. But the clerk, a man in his late 20s, grabbed a “wet floor” sign to defend himself and confronted the would-be robber, Peterson said. Rivera fled empty-handed after a brief exchange of words, he said. An officer responding to the call spotted three men arguing outside a nearby home on Covina Boulevard, Peterson said. One of them matched the description of the failed robber. The other two men turned out to be acquaintances of his. The clerk identified Rivera as the man who tried to rob him, the sergeant said. A pool cue was recovered. Booking records indicated Rivera was being held in lieu of $50,000 bail at the Covina Police Department’s jail pending a scheduled arraignment Tuesday in West Covina Superior Court. DIAMOND BAR — A thief or thieves turned out the lights overnight and Saturday morning for about 1,500 Diamond Bar residents after stealing wiring from an electrical junction box at a vacant car dealership, authorities said. The theft took place between 9:30 p.m. and 10 p.m. Friday at the site of the former Diamond Bar Honda dealership, in the 500 block of Grand Avenue, Los Angeles County sheriff’s Sgt. Angie Wilkinson said. The majority of affected residents had their power restored by noon Saturday, officials said.